The protein in the Asian food product nori has an anabolic and anti-catabolic effect. If you consume a few grams of it on a daily basis, you should be able to eliminate the muscle-degrading effect of the corticosteroid dexamethasone. An animal study that South Korean researchers at Pukyong National University published in Marine Drugs suggests this. The researchers gave mice the muscle-degrading corticosteroid dexamethasone for 18 days. Some of the mice also received a supplement with protein from the alga Pyropia yezoensis. Pyropia yezoensis is an edible alga. 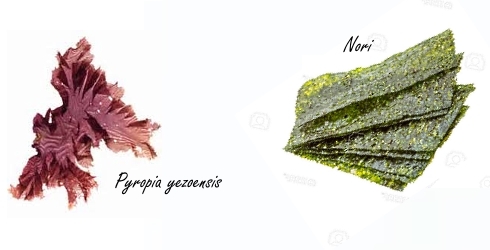 Dried Pyropia yezoensis is the raw material nori is made of, a food that is frequently used in Asian cuisine. Half of the mice in the experimental group received 150 milligrams of nori protein per kilo of body weight daily, the other half 300 milligrams of nori protein. If the mice had been human beings weighing 80 kg, they would have consumed 1200 or 2400 milligrams of nori protein daily. The dried nori sheets that you buy in the store consist of 40 percent protein, so you would need 3 or 6 grams of nori per day to get amount of protein the Koreans used. Administration of dexamethasone [DEX] reduced the size of the calves of the mice and reduced the muscle mass of, among others, the gastrocnemius calf muscle. However, administration of nori protein [PYP] prevented muscle degradation. Click on the figures below for a larger version. Dexamethasone increased the concentration of creatine kinase and lactate dehydrogenase in the blood of the mice, as shown above. Creatine kinase and lactate dehydrogenase are markers for muscle damage. Again, supplementation with protein from nori could block the effecs of dexamethasone. Dexamethasone reduced the activity of the receptor for IGF-1 [p-IGF1R] in muscle cells, nori protein abolished this effect. Dexamethasone reduced the activity of anabolic signal molecules such as Akt [p-Akt] and mTOR [p-mTOR], supplementation with nori protein eliminated these effects. Dexamethasone increased the concentration of catabolic proteins like Atrogin-1, but [it becomes monotonous] supplementation with nori protein also eliminated those effects. "These findings demonstrated that Pyropia yezoensis protein supplementation increased protein synthesis and decreased protein breakdown to prevent muscle atrophy," summarize the Koreans. "Therefore, Pyropia yezoensis protein supplementation appears to be useful for preventing muscle atrophy." Mar Drugs. 2018 Sep 11;16(9). 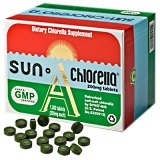 Environmentalists would cheer if we started eating spirulina instead of meat. But is spirulina protein good for our muscles? Okay, the human study that researchers from the Japanese Ryutsu Keizai University published in the Journal of Clinical Biochemistry and Nutrition has been sponsored by a manufacturer of supplements. Olimpiq StemXCell, a supplement made by the Hungarian Crystal Institute, repairs damaged tissues in mice.